People and pets are hard on carpets and the older your carpet gets, the more stains it will pick up. 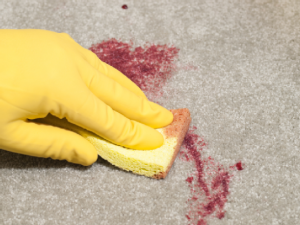 Whether from wine, coffee, fruit punch, oil or grease, stains to your carpet and upholstery can be heartbreaking. This is why 5280 Carpet Cleaning & Restoration is here to help. Our technicians and customer service representatives receive extensive training in the treatment and professional removal of stains and can answer any questions about the agents and techniques used. With their extensive knowledge and sometimes a lot of scrubbing, our technicians can remove or blend most stains. This is true of carpet, upholstery, tile and grout, and most fabrics. Stains that have been around longer are harder to remove so be sure to call today if you have a troublesome stain. Once your carpet has seen use for a few years, it will eventually need the care of 5280. Whether it is stained, in need of repair, or needs to be replaced, 5280 offers the most cost-effective solution for the job. Our technicians understand which carpets can be treated and which need repair, which stains can be removed and which are more catastrophic. 5280 will work to make sure you understand your options, tailor a cost-effective solution to meet your needs, and schedule a convenient time for the work. Call us today for all of your professional spot or stain removal needs for carpets, upholstery, or anything else around the home you need help with.